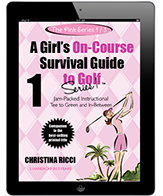 The first in this Pink Series of 3 based on the best-selling Pink book, A Girl’s On-Course Survival Guide to Golf. Inside this Digital Edition, you’ll explore solid fundamentals from grip, stance, ball position and alignment to must-know essentials when on the Tee Box. And just in case you’re down to your last ball, check out the Bad Shot Fixes section for shots off the Tee! The second in this Pink Series of 3, explores solid contact from the fairway, rough or bunker! You’ll explore solid fundamentals from set-up to must-know essentials from the fairway and off. Plus, get more sandys with better technique from the bunker. And just in case you’re down to your last ball, check out the Bad Shot Fixes section for shots from the fairway! The third in this Pink Series of 3, explores the short game. Getting good around and on the green saves lots of strokes. Inside this Digital Edition, you’ll learn how to get the ball close to the pin from 100 yards and in, sinking more putts, and mastering those six inches. And just in case your balls are going nowhere near the pin, check out the Bad Shot Fixes sections for Around the Green and On the Green! 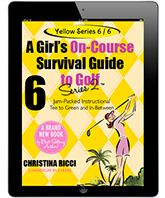 The Yellow iPad Golf App Series is a whopping 6 Editions spanning tee to green. 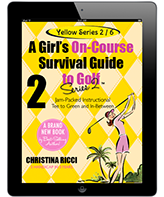 The series mirrors the Yellow and Green Printed Books, but goes miles beyond each with lessons galore. Each Edition is $18.99 Download from the iTunes Store Now! The first in this Yellow Series of 6!Inside this Series, I address the critical areas that need improvement in your game. I see common threads among players that continually frustrate and prevent them from getting to that next level. I am addressing these threads head on; real problems with real solutions. Plus, you’ll enjoy Grip and Power Tips Off the Tee with superstar Golf Pro Barry Goldstein! We close off this Series, as we do in all 6, with the awesome section: Before & Afters with Real Women! The second in this Yellow Series of 6, kicks off with a special Equipment Q&A on Clubfitting, an enigma to most, especially newer players. Learn the real deal to ensure you have the right clubs for your game. From there, we dive deep into all areas of the swing when on the tee box. We all want more distance and center-cut. This Series will get you there fast! We close off this Series, as we do in all 6, with the awesome section: Before & Afters with Real Women! The third in this Yellow Series of 6, addresses the whole enchilada: must-know woods set-ups, iron &, hybrid play, and the popular BAD SHOT FIXES section. 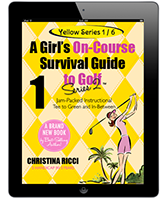 Inside this Series, our focus is to eliminate the not-so-solid shots that go nowhere into solid, on-target and on the green for more GIRs! Course Management and Mind Play play a key role and achieving those GIRs. We’ll dive deep between the ears and address those areas that need fixin’! We close off this Series, as we do in all 6, with Before & Afters with Real Women! The fourth in this Yellow Series of 6!Inside this Series, we take a journey off the short hairs into some rough areas. The goal when faced with shots off the fairway is to carefully assess the situation. Look up, down, and all around, so you can make an educated decision. Then, grab your pail and sandwedge, as we head to the beach to learn the must-knows from the bunker including a BAD SHOT FIXES section from the sand! We close off this Series, as we do in all 6, with the awesome Before & Afters with Real Women! The fifth in a series of 6!Inside this Series, I address lots of fun topics to get you on the fast track to better shots around the green, including the art of missing well. A never-seen-before new section, BAD SHOT FIXES Around the Green will address those wayward shots that result in too many swear words under our breath. We close off this Series, as we do in all 6, with the awesome Before & Afters with Real Women! The sixth in this Yellow Series of 6! We kick-off this Series with a very special section that will teach you creativity Around the Green! We’ll ditch the same ol’ and get creative together! From there, we head on to the green to putt. Putting represents almost half of all our strokes during a round, yet we spend maybe a quarter or less perfecting our putting. Let’s perfect it in this Series, including a BAD PUTT FIXES section. We close off this Series, with an awesome Before & Afters with Real Women! Explore interactive swing sequences, video lessons, real-time feedback from Christina, hidden tips and key points, and interactive Reviews and Pop Quizzes designed to expedite learning in an engaging and super-fun way with a splash of laughs. I just had to thank you for the work you have done. Your books and iPad app are, by far, the best and most comprehensive tools I have used. I have been playing for three years and LOVE the game. Since getting your materials two months ago, my handicap has dropped from a 31 to a 22! I just ordered your Green book and DVD’s. Can’t wait to see my scores drop below 90. 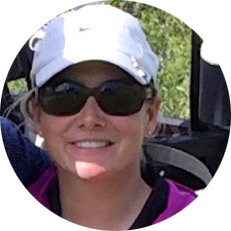 Please continue your mission to help women golfers! I hope someday you will make your way out to Northern California. Perfect for college and high school teams who want to win. Your Coach can tailor lessons to keep the team on track. Get real-time feedback from Christina! The Swing Sequences are one of my favorite features from the iPad App Series; interactive swing sequences spanning tee to green! Move through the swings frame by frame with key points along the way. A fun and effective way to expedite your learning. Check out this Golf Tip of the Week highlighting this cool feature to get you more distance off the tee!